There's nothing more elegant than a Southern style home. Beautiful and grand from the outside and charming and spacious on the inside. Southern house plans with 2 stories are the perfect place to host Holidays and other big family gatherings, as well as backyard barbecues and birthday parties. Southern children grow up drinking sweet tea on big wraparound porches and dream of having a similar home of their own one day. The memories created in these homes are priceless. 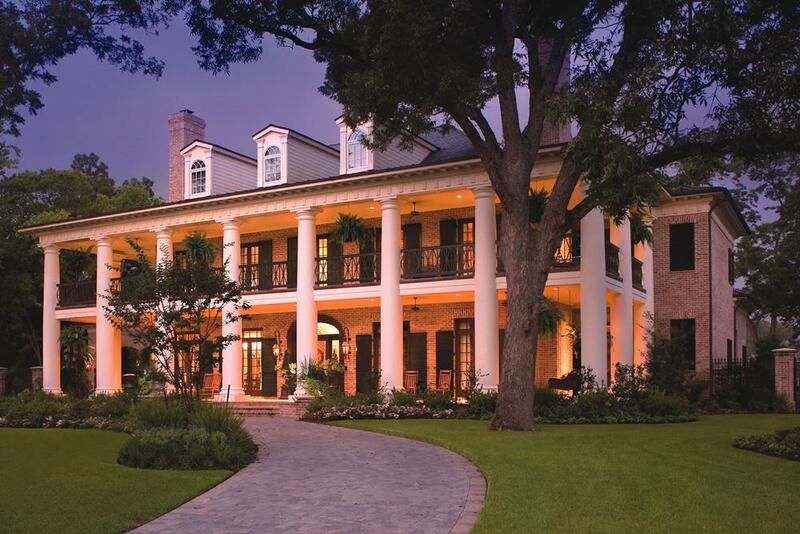 With the look of a quintessential Southern plantation, this home's most prominent feature is its full-width 2-story front porch with large Corinthian columns (House Plan #120-2531). How Do I Recognize Two-Story Southern Home Designs? • Exquisite landscaping to complement them. 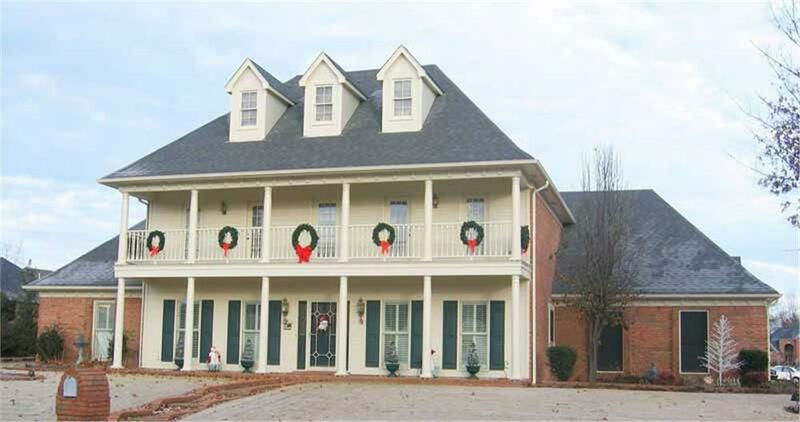 Two story Southern style homes are built with the ideas of family and comfort in mind. Though most are found in the south, similar styles have popped up all over the country, bringing with them some serious charm. These homes are built to look older and carry all of the same comfort that true Southern homes hold. Don’t let the older feel of a Southern house plan fool you. Though perhaps decorated with traditional style, the floor plans are often more modern and functional. They are generally large, spacious homes. Wide entryways, open floor plans, and large kitchens are just a few more of the many selling points of 2 story Southern homes. You’ll often find multiple entrances (front, back, side porch, and even in the kitchen at times), as well as multiple bathrooms and bedrooms. These houses can usually hold families of 5+ comfortably..
As in some older homes, there’s no waste of space in these homes. Each room has a purpose, and houses are built with thoughts of entertaining and socializing in mind. Even formal rooms that often showcase traditional décor are functional – whether used as a space for kids to finish homework or to have a nice cup of hot tea at the end of a long day. It’s all about comfort. Southern home decor is very dependent on the owner and often changes from room to room. You might see of a mix of traditional, modern, antique, vintage, or themed décor – perhaps even a bit of them all. Most of the homes boast beautiful crown moldings, charming light fixtures, and traditional style railings and finishes. Let’s have a look into the highlights of the home style. 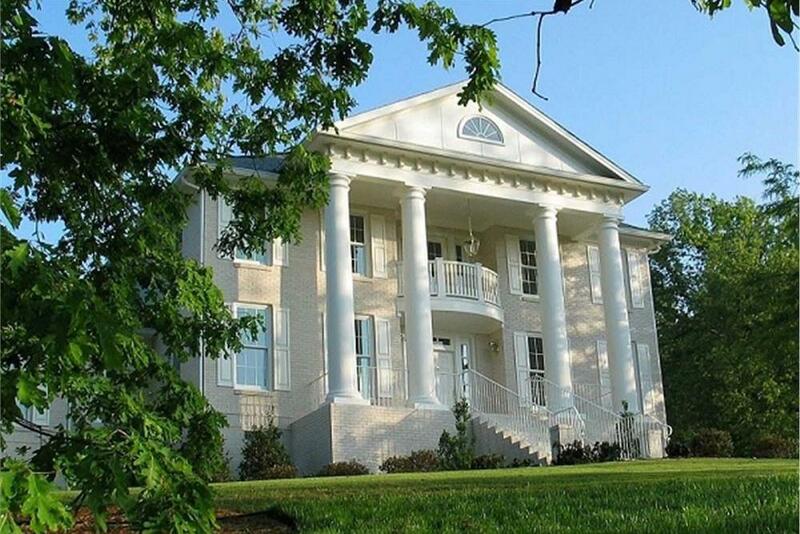 Neoclassical-inspired architecture is a common feature in the Southern style home. This 4-bedroom, 3.5-bath luxury home eschews the prototypical 2-story porch for a single-story porch and rounded balcony. The large columns nevertheless maintain the imposing feeling of a multi-story front porch (House Plan #178-1034). Relax on Covered Porches and Verandas! Modern style Southern homes often include two-story covered – sometimes wraparound – front porches and covered rear and/or side verandas. 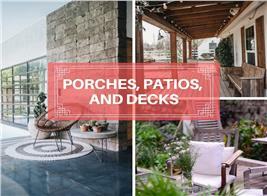 These spaces are typically used as an extension for outdoor living spaces and are great for entertaining. The shade provided by the porch roof – and commonly, ceiling fans – is a welcome relief from the heat of summer. Picture the entire family dining in the covered porch on a nice summer night or reading a good book on a breezy, relaxing fall morning. It’s the perfect addition to an already beautiful home. 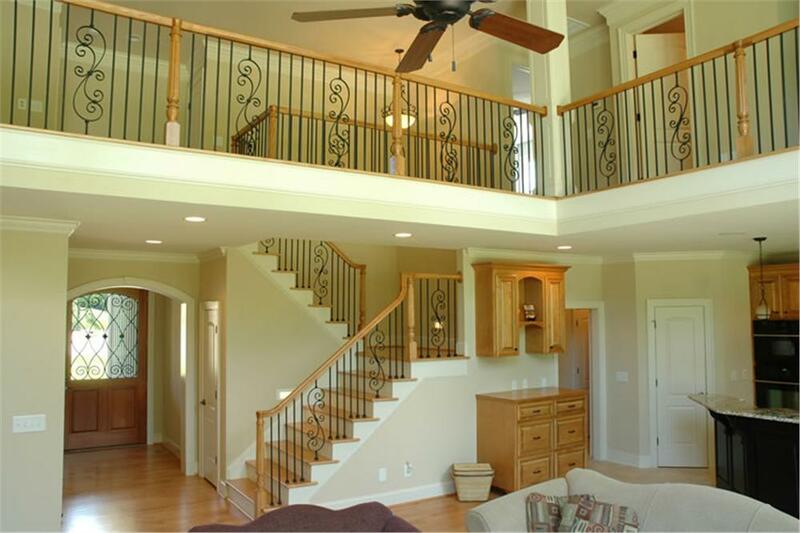 Can't you just see yourself relaxing on the upper or lower deck of this 2-story front porch? Unlike typical Southern style homes, which have flat or low-piched roofs, this 4-bedroom, 2.5-bath Colonial home sports a steep hip roof with dormers. Sharply sloped roofs aren't necessary in the South because there's no need to design for snow loads (House Plan 170-1343). The kitchen is the heart of the home, and this stands true for Southern style homes. You’ll typically find large kitchens with upgraded appliances. White cabinets are popular, but it truly depends on the taste of the owner. No matter the style, you can bet that gathering in the kitchen is encouraged – whether for a cup of tea or to socialize during meal prep. 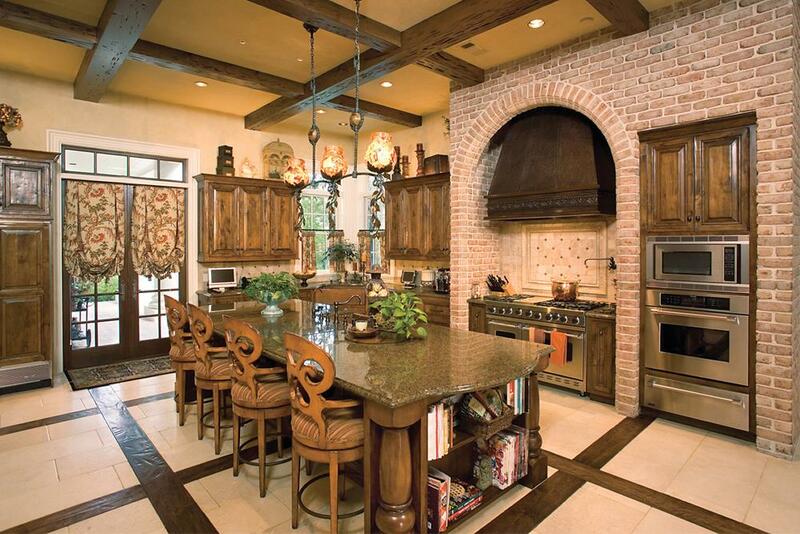 Large islands are often in the center of the kitchens, providing plenty of prep space for cooking. There’s often room to include a small table and chairs for casual meals with the family too. Taking its cue from Country-style kitchens, this welcoming space in the 6-bedroom, 6-bath, 2-half-bath home shown at the top of the article goes the extra mile to feed and entertain its family with its double randge, double wall oven, mammoth island, and soaring beamed ceiling (House Plan #120-2531). 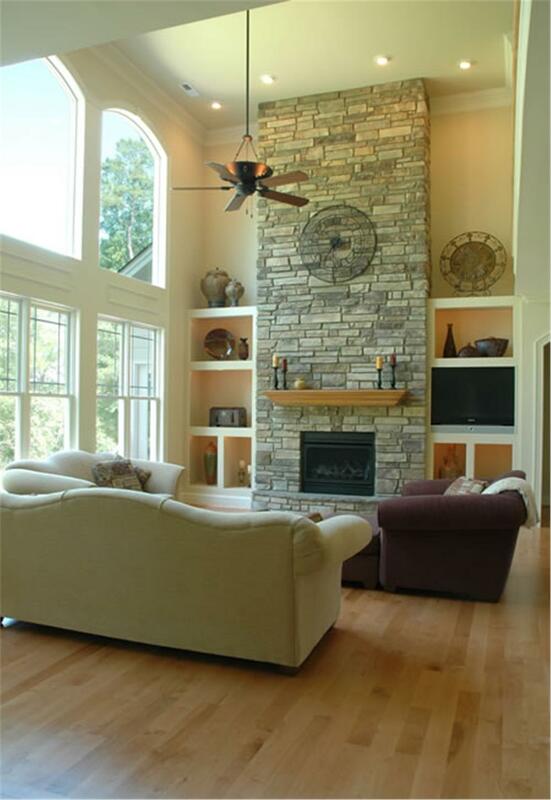 Southern homes often have formal living rooms, though they are waning these days. Time is mostly spent in dens or family rooms – especially when entertaining and hosting friends and family. Though these rooms are decorated to the owners’ taste, you’ll often see various themes: beach/coastal, farm, vintage, etc. Whatever theme, you can bet that comfort and functionality is top of mind. 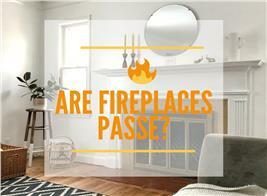 Depending on the location of the home, you might even find a fireplace as the focal point. These rooms are often so spacious that two couches can easily fit, as well as a few arm chairs, a coffee table, and perhaps even a small sitting area. Plenty of room for friends and extended family! Two views of a voluminous family room show what a modern Southern style home can offer in terms of family comfort and gathering. The 2-story fireplace and chimney in the photo at top is a welcoming focal point that complements the large expanse of large windows, also typical features of Southern homes. Seen from another angle, the view of the family room (above) shows the wraparound balcony and gives an even better sense of the openness of the space, with its clerestory, two-story ceiing (House Plan #120-2176). Bedrooms are often quite large and spacious in Southern style home plans. 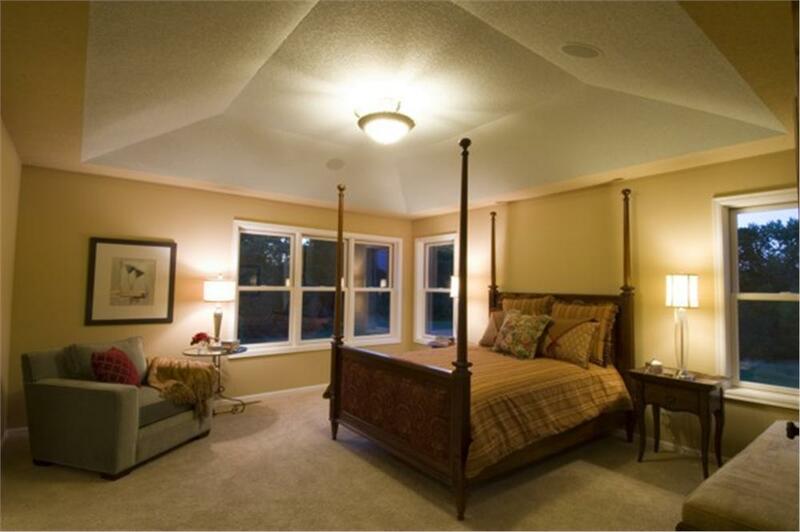 The master bedroom typically has a large ensuite bathroom, as well as at least one walk-in closet. Besides the master, you’ll often find a minimum of two or three other spacious bedrooms for kids or guests. In terms style, bedrooms, like family rooms, are often themed, and natural wood furniture can usually be found. Even if a more traditional style of furniture is used, bedrooms are typically styled in relaxing, muted tones to create a serene experience. The large master bedroom in the top photo, with its vaulted-tray ceiling and ample sitting room, is typical of the kind of sleeping quarters you can expect in a 2-story Southern style home. 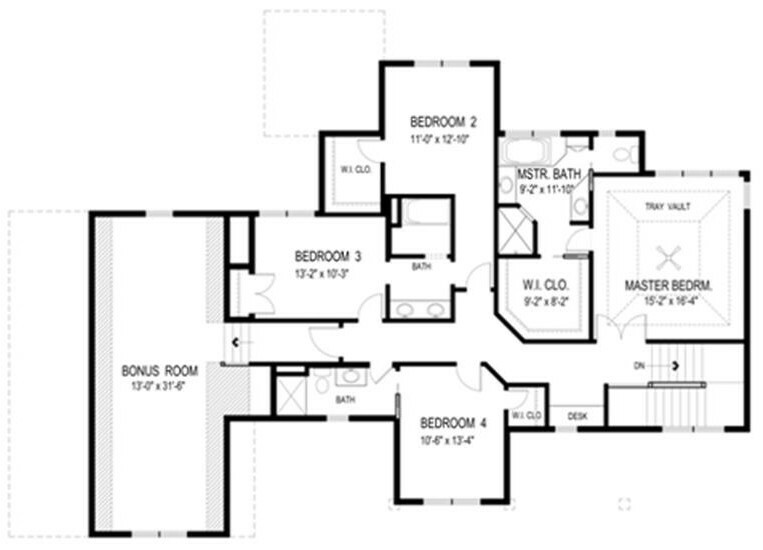 The upper-story floor plan (above) of the 4-bedroom, 3.5-bath home shows the layout of the suite that houses the master bedroom (upper right in plan) as well as the other 3 bedrooms, for plenty of sleeping area to accommodate a family. The bonus room at left could be made into one or two additional bedrooms or a recreational/game area for the family (House Plan #109-1191). 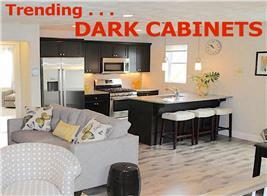 • Usually a minimum of one nice-size half bath, normally included on the first floor near the kitchen and living areas. 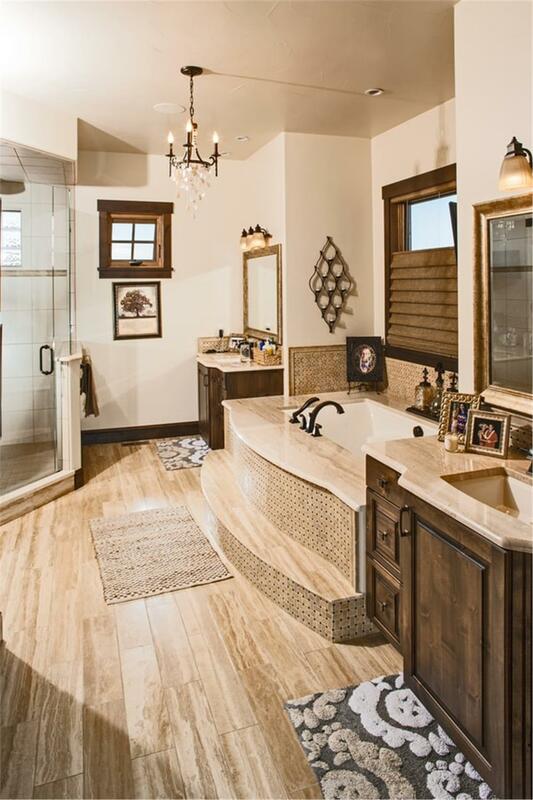 As with the dens and master bedrooms, it’s typical to find themed bathrooms in these homes. You’ll find more and brighter colors – such as blues, oranges, and yellowed – used here than in the rest of the home. Beautiful natural light is often found from various large windows. The guest bathroom on the second floor is easily large enough for children to use together. Equipped with both a bathtub and a shower and often double sinks, there’s plenty of room for more than one person. You’ll also find that bathrooms are never short on storage. 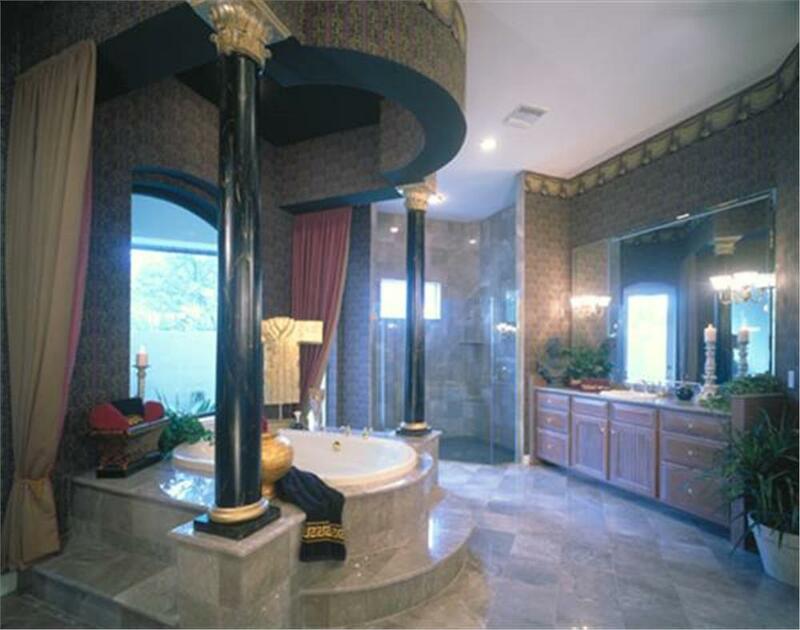 This sumptuously over-the-top master bathroom in a 5-bedroom, 5-bath, 3-half-bath 2-story Southern home brings colors – red, blue, yellow, gold, and green – into the bath to punch up the neutral tile, marble, and wood tones (House Plan #190-1014). Another example of a Southern home's luxurious bathroom – though far more muted that the one shown above it – this master bath in a 3-bedroom, 2.5-bath luxury home has split vanities for him and her, an oversize glass-wall shower, and a deep and wide soaking tub to spoil the owners (House Plan #161-1076). 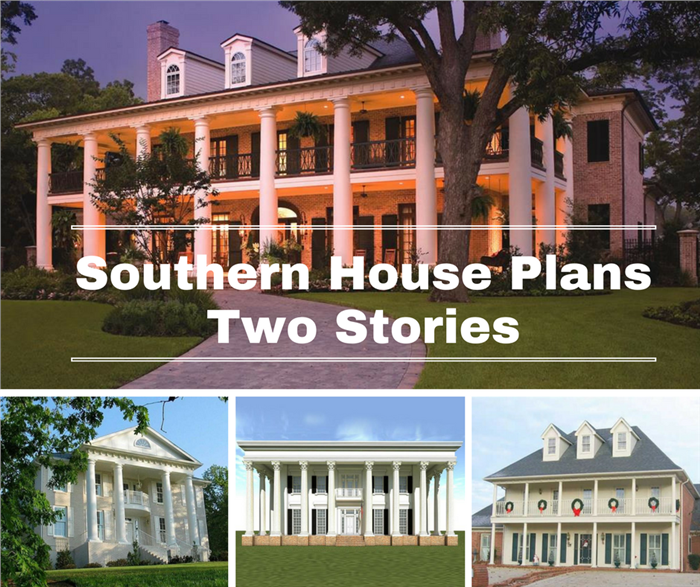 As you can see, Southern house plans with 2 stories are designed for comfort and functionality. Open entertaining spaces, practical kitchens, and comfortable bedrooms make for the perfect family home. Each room has its purpose, and space is never wasted. Charming features are found throughout the homes, and the elegance of the exterior easily extends to the interior. With such a beautiful canvas, there’s plenty of space to make your own mark. Your individual style is what will take a southern style home plan to the next level and create the perfect space for you and your family. Sit on the porch and drink sweet tea with your children, or relax in the den for movie night. This is southern living at home at its best. Footnote: the center bottom photo in the lead image for this article is of a 3-bedroom, 3.5-bath 2-story luxury Southern home with Colonial dn Georgian influences. For more information, click here (House Plan #116-1112).